Get involved in all the colourful festivals and weddings as you dive into the culture! Now working a summer at Oyster following my degree, I am filled with excitement (and an unhealthy dose of jealousy!) 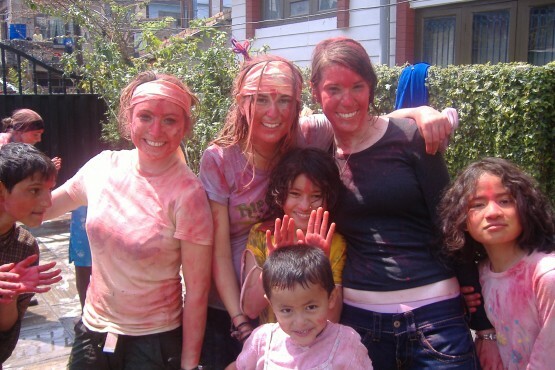 every time we get an application for our Nepal program – reminded of my own amazing 4 month experience back in 2008. Like many, I was drawn to this project as it seemed to offer everything from the challenging teaching experience to the 4500m trek in the Himalayas… and I wasn’t disappointed, the placement far exceeded my expectations! Being part of a Nepali wedding was simply something else – from wearing a sari, to dancing with the family, to the endless portions of food! Life as a local – As members of a cute little country sandwiched between two world super-powers the incredible diversity and national pride of the Nepali people was remarkable as ancient traditions and beliefs are endlessly respected and worshipped. Living with a host family we were immersed into the community and encouraged to get involved in everything. I will never quite be satisfied as a humble tourist having now lived like a local in Nepal: helping to cook the daily dal bhat; attending weekly Hindu weddings; preparing the rice wine for festivals and playing cards with my host family under torch light… How can a 2 week stay in Kathmandu possibly compare to that?! Trekking, rafting, safari… – For many, teaching and living in a local village would be enough for the perfect gap year or career break experience, but Oyster offered even more! 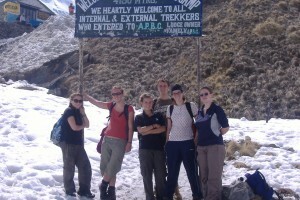 Our group had an 8 day Himalayan trek, white water rafting and a safari to keep us busy in the school holidays. Trekking was brilliant – the best way to bond with the rest of the volunteers when we first arrived and also a great way to see Nepal, staying in mountain guesthouses and learning all about the culture from our friendly guide and porters. We were in the perfect location, able to take a lovely one day trek to Nagarkot to watch a beautiful sunset; visit the temples and even challenge ourselves to a crazy bungy jump! My class were always proud of their work and excited to learn more which was a great feeling! Being a volunteer teacher in Nepal – daunting yet completely addictive! The kids were adorable and I left school feeling a great sense of achievement each and every day. I loved helping to bring some much needed imagination into the classroom from writing stories or autobiographies to performing a play. The location of the school in the heart of the village meant the perfect opportunity for extra-curricula activities from sports to dancing. As a group of seven volunteers spread across different communities in the Kathmandu valley we shared lesson plans and helped each other out. The local teachers were as lovely as the children and the initial nervous feelings were completely forgotten after day one! We are now recruiting for our January 2012 group departure and I have merely touched on the many highlights of this beautiful country and excellently organised placement. Do visit the website to find out how to become a volunteer teacher in Nepal or contact [email protected] for all the info and for more testimonials. Next Post Love sharks? &#8211; Don&#8217;t let horror stories prevent your great (and safe) experience in marine conservation!